For my friends. Introduce, I Taufik from Indonesia. 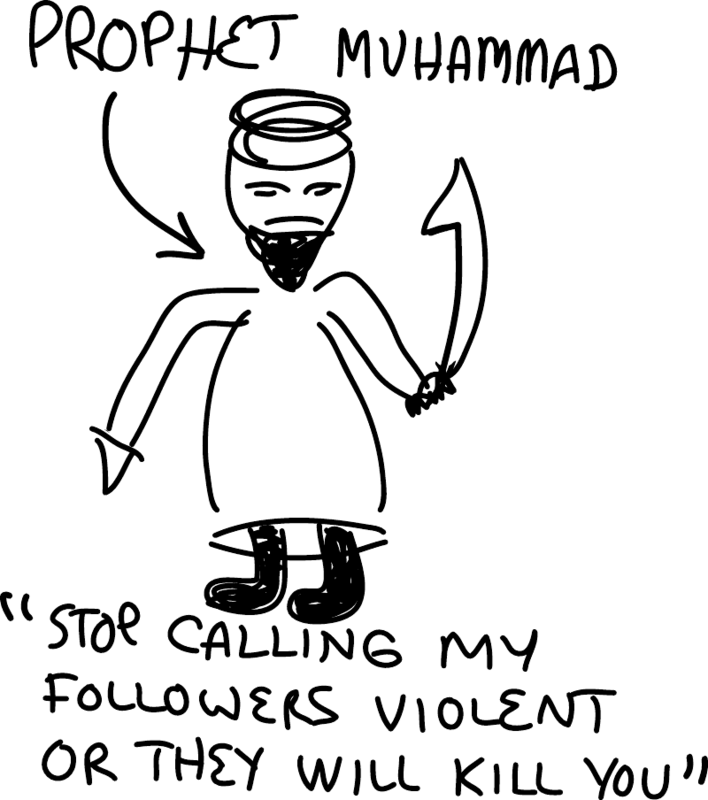 A few days ago I know there is a group on facebook called "Everybody Draw Mohammed's Day!". I do not understand about the purpose of the group. But as I look at is there about the freedom of expression or freedom of speech. Okay, I understand if the reason is. But if freedom of expression or freedom of speech by paying attention to others' feelings is far more beautiful? So in my opinion the best freedom is the freedom with caring for others. If this happens, then rapidly achieved peace in the world because we respect and appreciate each other. If freedom is causing havoc in the world, then that's really the worst thing. Perhaps we never hate others, it actually comes from ourselves. If we always think positive and loving, then any environmental condition, we will accept with a smile and our feelings will calm down. Feelings of calm will make the correct actions. Let others hostile or negative to us, which is important for us to prove to people that we welcome the positive, so I'm sure that person will also be positive, so that peace will be realized. I apologize for my writing something was not pleasing to you, because it comes from my mistakes, and the truth comes from Allah SWT. The last word, Is peace something beautiful? But if freedom of expression or freedom of speech by paying attention to others' feelings is far more beautiful? Does peace come from not insulting others? Or does peace come from ignoring insults? When I was a child, other children would insult and ridicule me. My parents taught me to ignore them. My parents taught me that their words had no power. My parents taught me that if I felt insulted, it was my fault, not theirs. 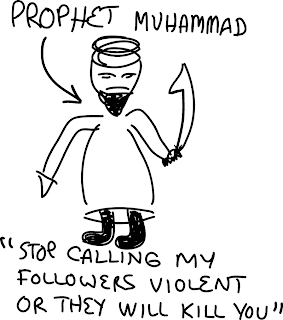 Someone described "Everybody Draw Mohammed Day" as an "I am Spartacus" moment. I think that that's right. "...But if freedom of expression or freedom of speech by paying attention to others' feelings is far more beautiful? So in my opinion the best freedom is the freedom with caring for others. " Lovely thought. Rather than expressing it to those who already agree - don't you think your efforts would be far more useful expressing the same sentiment to those many militant muslims and imams in your own country - or elsewhere in the muslim world? Or would that be too dangerous for you? Mr. Graham, I've added your image to my series and appreciate your absolute defense of human rights. While "lovely thoughts" are nice, our Constitutionally protected right to free speech is not there to protect the speech we hold dear, rather the speech we detest. For it does not, then ANY speech can be banned, censored or shut down as unacceptable. There is no middle ground on this. Either you are for free speech or you against it. Either you will defend free speech or you will make excuses and you are a coward. So...as Mr. Goska so appropriately mentioned, I am Spartacus. I hope all human races don't judge Islam until they do detail research about Islam using Al-Quran and As-Sunnah and also from Ulama' Ahli Sunnah Wal Jamaah. Please do you reasearch. If they do think Islam is right may Allah bless them to convert to Islam. I don't judge Islam, I judge Muslims. 90% of Muslims reject the idea of "freedom of speech" (according to a study by the Pew Research Center). The Muslim community as a whole either actively encourages violence against those who speak, or passively accepts the violence committed in their name. Few Muslims stood up to oppose the violence committed in the name of Islam against the cartoonists, and those few who did were largely ignored. I don't know what Islam says about "freedom of speech', I just know what Muslims say about it, and Muslims are wrong. It is unfair of the world media to back down from saying what they would like to of Islam. I don't think it necessarily needs to be insults, but we should not be intimidated. Making fun of someone's religion is never classy, but in this case, and especially at this time, I think we need to. The Islamic world is in an uproar, like a child's tantrum, and if we give into the demands of the tantrum, you raise the child poorly, and are asking for a lifetime of struggle. When the tantrum comes, you stick to your guns, and although it may be hard, you don't capitulate. I wrote a blog note about it as well, called anuglytool.blogspot.com , but I suppose I am being a coward by concealing my identity even though I work with Arabs. Thank you for your post.